The enormous dipper composed of stars from Pegasus, Andromeda, and Perseus takes up a good chunk of the sky. From midnorthern latitudes in early November, you will see this formation overhead in the evenings. The southwest horizon is below the bottom edge of this image. High overhead around the 8 p.m. local standard time is a bright configuration of stars that people unfamiliar with the sky often mistake for the Big Dipper. Big it is, but – at least in an official sense – a dipper it is not. This large figure is not usually described as a dipper in most stargazing guides; you shouldn't expect to find any recognized authority for this Autumn Dipper. Truth be told, when starry dippers are mentioned, most people immediately think of the Big Dipper and the Little Dipper in the northern sky, and perhaps even the inverted Milk Dipper in Sagittarius. The Autumn Dipper, in fact, looks like a much larger and brighter version of the Little Dipper. The "bowl" is composed of the Great Square of Pegasus, the Flying Horse. The Great Square is one of the unmistakable landmarks of the night sky. The Square is not a constellation in itself but belongs partially to Pegasus and partially to Andromeda, the Princess, and helps find both. It is not a perfect square, appearing slightly battered out of true square shape. Pegasus actually supplies only three stars of the Great Square: Markab, Scheat and Algenib. 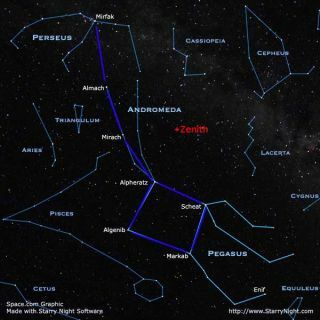 The fourth is Alpheratz, the brightest star of Andromeda. The "handle" of our Autumn Dipper is composed of stars belonging to the constellations Andromeda and Perseus. Alpheratz, Mirach and Almach are almost evenly spaced toward the northeast and are the brightest stars in Andromeda. The next bright star, located along the same line, Marfak (sometimes spelled Mirfak), is the brightest star of Perseus. Two of these four stars (Alpheratz and Markab) are valuable navigational stars and the nose of the mythical horse contains yet another in Enif. Pegasus is, of course, the famed winged horse of Greek mythology. He's been found on ancient tablets from the Euphrates Valley, and on Greek coins that were minted during the fourth century B.C. In legend, he was born from the blood of the gorgon Medusa when that monster was slain by Perseus. When Pegasus was brought to Mount Helicon, one kick of his hoof caused the spring of Hippocrene to flow – a source of inspiration for poets. In another tradition he carried the thunder and lightning for Zeus. The old star atlases that used allegorical drawings depicted Pegasus turned over on his back with his body outlined by the Square. Some years ago I was giving a lecture under the dome of the Space Theater at New York's Hayden Planetarium when, using my electric pointer I tried tracing out Pegasus. "So that's Pegasus . . ." I started to say, when suddenly, from out of the darkness I was interrupted by a voice that spontaneously exclaimed: "I see it!" I then finished my sentence: ". . . but for people today to honestly claim that they can actually visualize the upside-down front half of a flying horse is a masterpiece of imagination!" I don't think I ever heard more laughter from an audience than I did after I delivered that line.